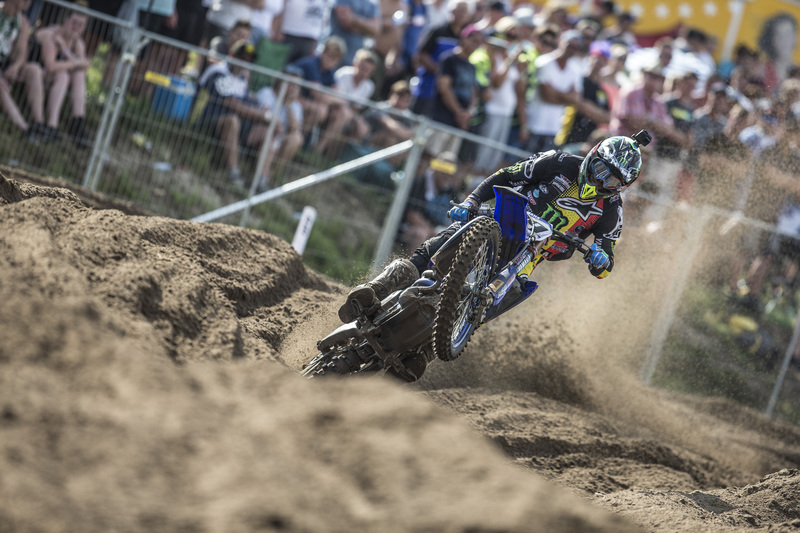 Yamaha had a strong presence inside the premier class at the fifteenth round of the FIM Motocross World Championship in Lommel, Belgium, with all four riders finishing inside the top-ten in the overall classification. Monster Energy Yamaha Factory MXGP’s Romain Febvre was the star performer and finished on the same points as the rider that finished in third place, while Wilvo Yamaha Official MXGP’s Jeremy Seewer almost pressed home his first ever top-five finish. Jeremy Van Horebeek and Shaun Simpson finished eighth and tenth, respectively. The racing was fierce out on the unforgiving sand of Lommel, Belgium, as the riders battled the gnarly track conditions and each other. In the opening race of the weekend Febvre, Van Horebeek and Seewer made up the top-six on the exit of turn-one. Febvre had an excellent battle with Tim Gajser where they swapped third-position a few times before Febvre managed to break away. With the cloudless skies and scorching hot temperatures being a factor in the riders’ strategy, Van Horebeek rode with the second moto in mind, knowing that in this sort of heat it is better to ride without taking any risks in order to conserve energy. As the Belgian dropped back to eighth-place, Seewer impressed as he drove home a top-five race finish, his third of the season. Wilvo Yamaha Official MXGP’s Shaun Simpson had looked forward to racing in Lommel all year long, so he was disappointed to have crashed three turns in, after lining up in ninth-place following his Qualifying Race finish. Regardless of his misfortune, the Scot put in remarkable ride as he charged to eleventh place all the way from last. After cruising to third in the opening race, Febvre set out for a repeat performance in Race 2. Without the same kind of start, a top-three finish would be a big task. The Frenchman pushed hard, and as he scrapped the bottom of the barrel while searching for smoother lines and opportunities to move forward, he fell from fifth-place with 15-minutes left on the clock. Febvre only lost one position, of which he managed to get back with another crafty pass on Tim Gajser, as Seewer pressed home a sixth-place finish after coming back from outside of the top-ten. Febvre was fourth overall in classification, although he had exactly the same amount of points as the rider who finished third, while Seewer matched his season best overall finish with another sixth place. Van Horebeek knew that the physical demand of the Lommel circuit would be his biggest foe, and he was right. The Belgian opted to survive the hot and testing conditions and managed to string together two top-ten finishes, 8-9, for eighth overall. Like Van Horebeek, Simpson hit the wall at the midway mark. The thirty-year-old was strong on the rough conditions and while he felt mentally ready to post a top-seven result, he had exerted too much energy on his remarkable ‘come-back’ in Race One. Nevertheless, he managed to join his Wilvo Yamaha Official MXGP teammate inside the top-ten. Febvre was frustrated with the end result, fourth place, despite finishing on the same points as Max Anstie in third, Seewer could relate having wrapped up the Belgian Grand Prix in sixth overall, a few points short of achieving his goal of a top-five finish. The next round of the FIM Motocross World Championship will take place on Seewer’s home turf in Frauenfeld-Gachnang, Switzerland.